I am a new man! Dr. Nottingham I can't thank you enough! Heartburn Free. I am a new man! Dr. Nottingham I can’t thank you enough! Heartburn Free. I can’t believe your outstanding work on my smile. When I use to talk I use to always try to cover my teeth with my mustache or my lips. After my treatment today I am a new man! I smiled all the way home. When you first started my dental work I could not bite, or I think you said I had no bite, I also suffered severely from heartburn. But now after my treatment is complete, I am heartburn free. Its amazing all the Rolaids I had to take when my medical doctor never suggested that it may have been my poor dental care from the past. Dr. Nottingham I can’t thank you and your wonderful staff enough for all the kindness and gentle treatment I received in your office! I show off my new smile to everyone! 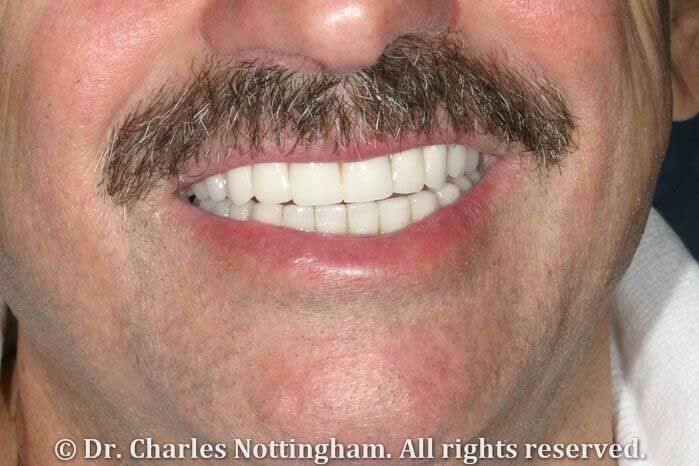 Treatment Length with Dr. Nottingham: 10 years.